The centrifugal machine for human birth...its hard to even finish that sentence, let alone finish it without wincing. What could possibly go wrong, or right, with spinning a pregnant woman strapped like Hannibal Lechter on a spinning turntable? "In the case of a woman who has a fully developed muscular system and has had ample physical exertion all through the pregnancy, as is common with all more primitive peoples, nature provides all the necessary equipment and power to have a normal and quick delivery. This is not the case, however, with more civilised women, who often do not have the opportunity to develop the muscles needed in confinement." --from the Blonsky patent. "Therefore, wrote Blonsky and Blonsky, they would provide "an apparatus which will assist the under-equipped woman by creating a gentle, evenly distributed, properly directed, precision-controlled force, that acts in unison with and supplements her own efforts".--Marc Abrahams, quoting the Blonsky patent in The Guardian (referenced above). So begins this extraordinary work known as the Fitzwilliam Manuscript1: Isaac Newton's name, plus for words on two lines, which the Newton scholars suspect to be a key to a cipher. It was purchased at a Sotheby auction by Maggs Brothers in 1936 for £180, and within the month found itself in the Fitzwilliam Museum. What makes it fantastic--aside from having some mathematical/physical work by Sir Isaac in its 5,000 or so words--is the almost impossible inclusion of a list of what Newton could remember of the sins that he had committed. He finds 47 transgressions within his memory. It seems to me that listing the sins of people is nearly as old as writing, since the absolutely overwhelming aspect of that practice is describing sin in general or, of course, the sin of others. Or the judicial end, the sins of people have been listed and judged many millions of times for billions (or whatever) of offenses. And certainly the listing or provocation or announcement of sin has been endless fodder for entertainment in the forms of story telling, theatre, novels, and so on. Then, too, there's all of the religious indictment and beseeching for proclaiming sins for atonement. On the individual level for a living human, a famous person, it is extremely uncommon to find a highly personal listing like this, even whispered as they were into a notebook, Sir Isaac I am sure thinking as though this was almost as good as writing the sins in dust. I wonder how he would feel, seeing people discussing them, like this? This transcribed list comes from the fantastic Newton Project,2 site. Not loving Thee for Thy self. 1. From the website of the Newton Project (described following): "Miscellaneous notebook containing Newton's accounts for 1665-9, a series of increasingly complicated mathematical problems, and a highly revealing personal confession. At Whitsun 1662, Newton compiled a list of all the 47 sins he could remember having committed in his life, from stealing cherries to "threatning my [step]father and mother ... to burne them and the house over them". The accounts section charts the beginning of his study of alchemy in 1669, with purchases of books, materials and a furnace to equip the makeshift laboratory he set up in the grounds of Trinity College." 2. The Newton Project is the work of Professor Rob Iliffe (Director, AHRC Newton Papers Project) and Scott Mandelbrote (Fellow & Perne librarian, Peterhouse, Cambridge). I feel slightly queasy seeing this photograph, found in the August 1937 issue of Popular Science magazine--it seems to me to be a backwards, inside-out analog cyberpunk (without the cyber) variety of the internet, a robotic device moving people around from data bit to data bit, an oil and iron process of automatic info retrieval, moving the user to the information rather than the other way around. The image does put me in mind of Terry Gilliam's Brazil, which renders info and other muck in a high-dystopian fashion with endless ducts and file cabinets, making things oppressively inaccessible in their accessibility. And to some degree there's a little Spongebob similarity in there too, though without the iron nd metal part, just Mr. Squarepants and his cardboard filing cabinets for all of this thoughts and memories, serviced by smaller units of himself whop presumably have their own filing systems in their heads. Filing cabinets, all the way down. 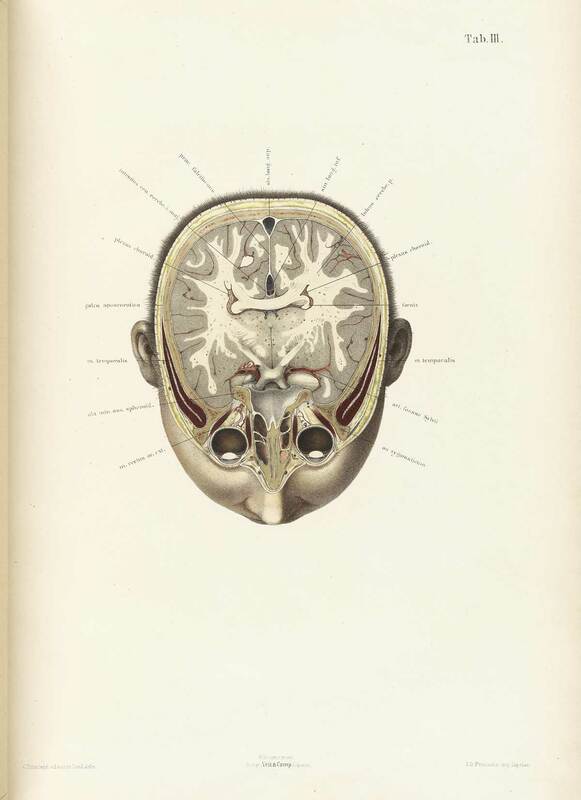 There is a more-refined image of what is basically the same idea, found here in the fantastic bio-art of Fritz Kahn (1888-1968), who published his Der Mensch als Industriepalast (Man as an Industrial Palace or thereabouts) in Stuttgart in 1926. Kahn is seen as a "modernist", which I guess is true; to me he is far more than that--he's "different". And finally, an image of the semi-reverse of the gigantic filing system: moving humans through mounds of paper not contained in file cabinets, stacked upon stacks of stacks. Once everything is said and done, none of this info-sausage-factory seems very pretty. I do not know the precise date when displaying the death of children was used to sell detergent. There were deep hints of a child's death in a Twilight Zone episode (selling Borax) in the ate 1950's, but in general I think that killing kids on television for story development and entertainment is more an '80's creation than anything else. Children dying in stories on television had been verbotten, a non-starter, for decades; now kids die in Dr. House's hands and all over the rest of that wasteland place and there's barely a wrinkle in the entertainment continuum. Killing children in literature is entirely different, and of course much older. Given the overwhelmingly and horrible basis of the news reports of the Old Testament, I wonder what the great flood would've looked like on OT TV? After all, it was reported that the creator did away with almost everything on Earth--men, women, and of course every child and baby on the planet, drowned like rats in a bag, but without a bag--kids left to float away from their parents, and then drown, sinking into the cold black sea created by the very thing that created them. Kids killing things in play is another matter, especially since it is done so for fun. I guess they smote or smitted things for time immemorial, but it wasn't until very recently, and mostly with the invention of the middle class and the creation of disposable income, that killing toys were sold to kids in stores. Toy guns and knives and other implements of destruction at least made whatever the kids were doing a face-to-face activity. When the atomic bomb toys started to appear in the late '40's, killing stuff took on the potential of worldwide destruction. Of course I doubt that any kid playing with these atom bomb toys had an inkling of what it meant to use the weapon in the real world, but the appearance of atomic bomb toys--while not quite yet at the level of Auschwitz board games--is on the revolting side. On the other hand the destruction of entire galaxies has been witnessed by kids in any number of movies and television programs, what with billions of living being killed in the process. I don't know what the effect is of exposing children to mass killings in the name of grand theft auto, let alone opening apocalyptic floodgates by putting nuclear weapons within their reach. It just isn't right. Does these things, below, seem appropriate to you? Take for example a simple matter in this detail from a U.S. Patent Office report for game pieces for a board game--the pieces were described; the game wasn't. The inventor, Verne Sellers, provided tanks, artillery, an air power of some sort, a "shield", a general, a few undesignated items, and of course an atom bomb. 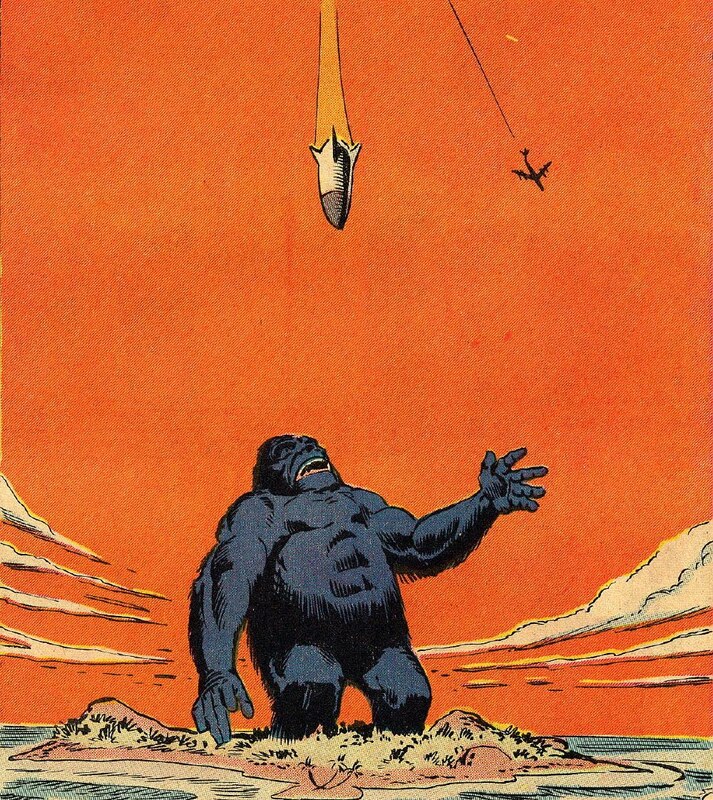 The atom bomb would make things all right. And then there is the "Safe, Harmless, Giant Atomic Bomb", which is something that is made to sound so much like nothing that it gives "nothing" a new meaning. Total destruction as a game, or game piece; an oxymoronic trivial pursuit. Is there anything more revolting than this solitary, encapsulated, iron maidenesque survival sarcophagus and its promised hope of survivability? Perhaps not. This patent application for an individual survival suit from 1958 gives us something to think about, perhaps gives us the cause to imagine what the world would look like from the inside of that portable evacuation chamber (that had its own attache case for storage). The bomb(s) would go off, and there you would be, standing with your back against the wall, or laying in the gutter pressed against the curb, just another piece of the dead city, another piece of metal waiting to decay. I'm not sure what is going on in this scene, which while being crude is still steeped in a high-creep factor. I get the impression of slow time in these images, as though the atom-bomb-suited people have been there for a long time, though I suspect that we are seeing an urban area just after a blast. It is a wincingly bad scene. Here's another example of some unusual thinking on surviving nuclear holocaust, 1958, only these--while solitary--are not terribly mobile, even if they did come with wheels. (Didn't it bother anyone that something that was supposed to prevent you from flying glass and bricks and the terrestrial ring of fire could be moved around on such tiny wheels?) They look more like waste receptacles. Maybe that's what they would wind up being, if they were ever used for their intended purpose. And another atomic bomb "garment-like" thing--this looks like it might actually be useful on airplanes, because most people who die in crashes do so from smoke inhalation...but providing one of these per person would be a bad flying vibe, just like seat belts (so ferociously resisted by Mr. Iacocca) were seen by the car industry as an unnecessary reminder of how dangerous cars were/are). Anyway, the only way these things might be useful in times of such an emergency as atomic holocaust would be as a burial shroud. And since a bunch of people would (presumably) already be wearing them at the time of attack, the job of burying them would be that much less work, since they were already shrouded. Of course, that's assuming (a) that people would or could be buried, and (b) that there was anyone left to do the burying. Precursor to Zombie-Phone-to-Deadsville: the Telephone Medical Metal Detector "X-Ray"
Did President Garfield Die Because of Metal Bed Springs? Much earlier, only five years after Alexander Graham Bell first patented and published his invention of the telephone, the device was used by Bell to do some very early electrical medical imaging. The new President of the United States, James Garfield, had been shot by Charles Guiteau in Baltimore and Potomac Railway Station (on 2 July, 1881, after a lengthy period of semi-abstract stalking and planning) Station in Washington, D.C., receiving fatal wounds in July and which would cause his death later in September. The problem was that at this point in the history of surgery it was difficult to locate bullets in the body, becoming more so if the bullet took a non-straight course through the wounded. Normally, in 1881, a doctor could for example use a device called a Nelaton probe, a thin porcelain device (as opposed to most other probes, which were metallic) to help locate the embedded bullet. But given the nature of Garfield's wounds, this was just not applicable, and the bullet escaped recognition from this and other probes. Bell enters the scene with an electromagnetic invention, the induction balance, which he created to detect interference on a telephone line. In the process of experimentation Bell recognized that the balance could be disturbed if the metal and battery-fueled probe came into contact with a piece of metal.--basically, the device was a medical metal detector. Bell resolved to use the device on Garfield, passing the probe along the President's body while another person listened to a telephone ear piece for the telltale "click" of a proximate metallic object. Bell was not successful with this, or at least not so at this time, and the President died, succumbing to an infection, finally. But Bell was able to perfect this instrument, something that stayed in use as the principal means of detecting metal objects in the body, and was about as fine an instrument as could be expected, though it was completely eclipsed by the revolutionary machines brought about by Wilhelm Roentgen's discovery of X-Rays in 1895. And as it just so happens, the first surgical case in which the x-rays were used was for a case involving a shotgun wound. Finally, one of the reasons why Bell's instrument didn't quite work on President Garfield is that Garfield's bed had a metal box spring, which very well might have played havoc with Bell's instrument. Perhaps if there was no metal in examining area, Bell's device might've worked. An earlier and more crude device had been invented by Wilhelm Heinrich Dove (1803-1879, a German physicist and early meteorologist) though I am not sure that it comes into play with Bell's apparatus at all. "The experiments made by Professor Alexander Graham Bell with the view of determining by the aid of the electric current the location of the bullet in the President's person were of the most interesting nature. The possibility that a time might come when it would be necessary to make incisions at once for the removal of the bullet, without consuming precious time for further consultation, gave to the experiments an importance which added greatly to their interests." "An apparatus known as the induction balance had been used by Professor Bell in analyzing metals. This instrument, modified so as to impart to it the highest degree of sensitiveness, was used in the search for the leaden ball. Its nature is such that it is not easily understood except by electricians. It consists of a battery, two coils of insulated wire, a circuit-breaker, and a telephone. The ends of the primary coil are connected with a battery, and those of the secondary coil are fastened to the posts of the telephone. This latter connection renders audible any faint sound produced by the circuit-breaker, or any change in the pitch of that sound. The coils may be so placed in their relationship to each other that no sound is made by the circuit-breaker. They are then said to be balanced, and the wires are extremely sensitive to the disturbing presence of any other piece of metal. A bullet like that with which the President was shot, before it was flattened, will, when placed within two and one-half inches of the most sensitive point on the pair of coils, cause a faint protest against the disturbance to arise in the telephone. A flattened bullet of the same bulk, when presented with its flat surface toward the coils, will make its presence felt at a distance of nearly five inches. When its sharp edge is turned toward the plane of the coils, no sound is produced beyond the distance of one inch." "With these facts in view, the experiments to locate the position of the bullet in the President's body were begun. The patient was bolstered up in bed, and he watched the proceedings with mute interest. His physicians stood around. Professor Bell stood with his back toward the President, holding the telephone to his ear, while Mr. Tainton, Professor Bell's assistant, moved the coils over that portion of the abdomen where the leaden ball was thought to be imbedded. When the sensitive centre of the instrument was immediately over the black and blue spot that appeared shortly after the President was wounded, Professor Bell said, "Stop! there it is." "The experiment was repeated several times -- once with Mrs. Garfield listening at the telephone; and she told the President when the coils had been brought to the spot where the presence of the bullet had previously caused the delicate instrument to give forth a singing sound. From these tests it was inferred that in any event the bullet was less than five inches from the surface, and that if it was only slightly flattened, or if its edge was turned obliquely toward the surface, it might be much nearer to the skin. The conclusion reached was that if it should become necessary to remove the bullet at any time, this might be speedily accomplished by two quick cuts with the surgeon's lancet." It was this lovely engraving from Richard Bradley's A General Treatise of Husbandry and Gardening..., printed in London in 1721/2, that brought up the issue of structure in creation, and how that issue was in one way approached by the new tool in the scientific toolchest, the microscope. "...the Contrivances of the Almighty Creator is as visible in the meanest Insect of Plant, as in the greatest Leviathan or the strongest Oak. To touch upon all the Wonders this Instrument shews us would be infinite"--William Molyneux, on the microscope, in his A Treatise of Dioptricks in Two Parts (1692, quotation fro the second edition of 1709 via Marjorie Nicholson's Science and Imagination, Cornell, 1956. The question that the microscope---newly introduced and popularized by Robert Hooke in 1665 and Anton van Leeuwenhoek in 1674--was so able to address at this time was the question of the structure of things, and whether the Almighty Creator allowed for unrestrained creativeness or if the cosmos was subject to patterns and forms. The microscope was so tremendously nimble that it allowed its observers the luxury of finding "correct" answers on either/both sides of the issue, that arguments could be well made and sustained for variety and regularity. But of course all found the reason for either end of the argument deeply seated in the e hands of god, as seen in the lovely quote below by the great early microscopical popularizer, Henry Baker1. But this is just the tiniest bit of a nod at the question of structure in the history of science, a search for the relationships between, well, things small and large: atomic, molecular, cellular, organism, population, ecosystem,solar system, universe. The issue of structure may be the only issue--perhaps if you were made to select one question to have answered, automatically, an answer for everything, it might be this issue of how things stand in relations to one another. Which gets us to this 1721 engraving of a tree-covered hill, following the designs of a human creator, a re-animator of the natural landscape according to a theory of beauty, part of which hangs in the form of a triangle in the right-hand upper corner. A three-sided strategy of the relationships in nature, provided by a human vision. A very small appreciation of an attempt to recognize the relationships between things, and in this case, the beauty of trees and hills. 1. "The first Part of this Treatise discovers in the Particles of Matter composing Salts and saline Substances, Properties whose amazing Effects would surpass all human Belief or Conception, were we not convinced of their Truth by the strongest ocular Demonstration. That beautiful Order in which they arrange themselves and come together under the Eye, after being separated and set at Liberty by Dissolution, is here described and composed but one kind of figure, however simple, with Constancy and Regularity, we should declare it wonderful: What must we then fay, when we see every Species working as it were on a different Plan, producing Cubes, Rhombs, Pyramids, Pentagons, Hexagons, Octagons, or some other curious Figures peculiar to itself; or composing a Variety of Ramifications, Lines, and Angles, with a greater Mathematical Exactness than the most skilful Hand could . draw them?" "Sensible of my own Ignorance, I pretend not to account how this is done: all I know is, that Chance or Accident cannot possibly produce Constancy and Order, nor inert Matter give Activity and Direction to itself. When therefore these Particles of Salts are seen to move in Rank and File, obedient to unalterable Laws, and compose regular and determined Figures, we must recur to that Almighty Wisdom and Power which planned out the System of Nature, directs the Courses of the Heavens and governs the whole Universe." -- Original, shorter quote of Henry Baker in his Employment of the Microscope (1753) found in Nicholson's book; the above, longer version is from the 1764 (and second) edition, found here. In the entire invento-sphere of things crying out for suitable invention, this "innovation" in smoking is surely not one of them. Perhaps if you needed an additional bit of strangeness in developing the quirkyness of an impossible boss for a character in a movie--someone who needed to be able to be free of the responsibility of flicking the ashes from their ciggie as they screamed at a subordinate, or a cook using the device to free up both hands while preparing a meal, or etc.--then I guess this invention could be part of the genius of a role. Beyond that, I don't know...particularly if there was a smoke-in-bed version. Perhaps the downfall of such a device is seen in the eyes of the model, which are transfixed on the ashes in her nose tray. Maybe the settling of the ashes two inches from your nose would be a hypnotic event, altering the wearer's sense of place and attention, giving you poor vision, and a certain sense of smoky sullenness. This image comes from a stockpile of loose bits that have fallen out of various magazines--this one from Popular Science for October, 1937. Source [National Library of Medicine]: Braune, Wilhelm. 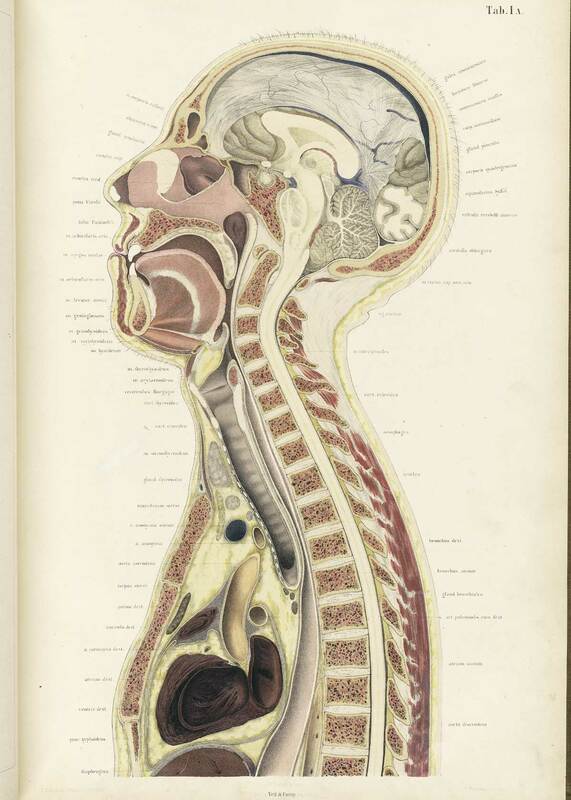 Topographisch-anatomischer Atlas : nach Durchschnitten an gefrornen Cadavern. (Leipzig: Verlag von Veit & Comp., 1867-1872). And Supplement: Braune, Wilhelm. Die Lage des Uterus und Foetus am Ende der Schwangerschaft. (Leipzig: Verlag von Viet & Comp. , 1872). "[they are] taken from the body of a powerful, well-built, perfectly normal man, aged 21, who had hanged himself. 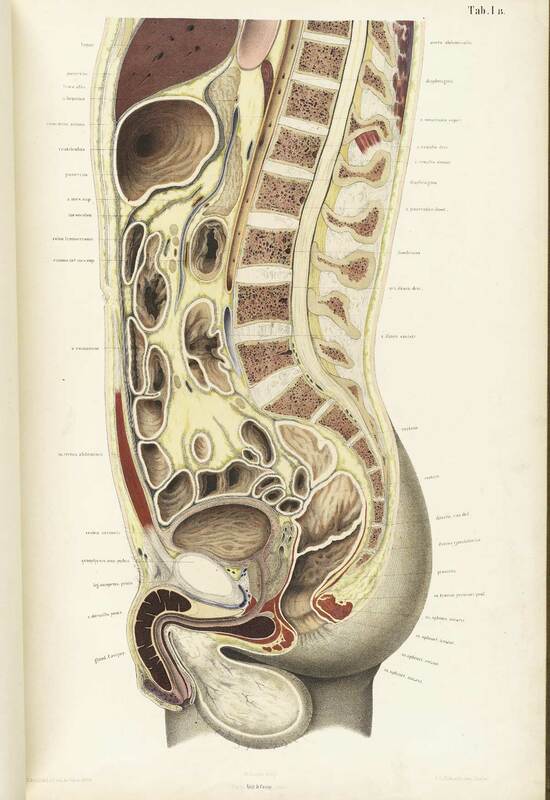 The organs exhibited no pathological abnormalities. The body, which was brought unfrozen, was placed on a horizontal board … In this position, the subject lay untouched in the open air, and at the temperature of about 50 degrees F., for fourteen days. 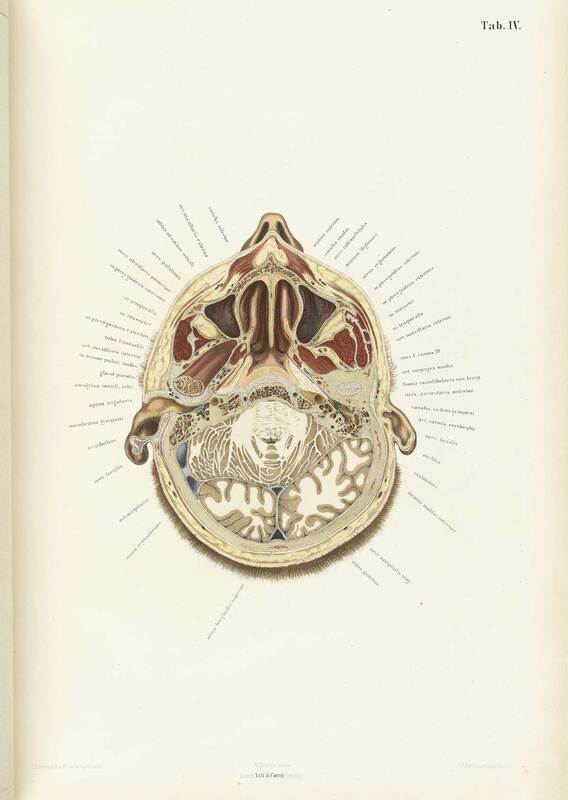 At the end of this time the process of freezing was commenced and completed …"
"After sections were cut, thin paper was placed over them and tracings were made of the anatomical features. 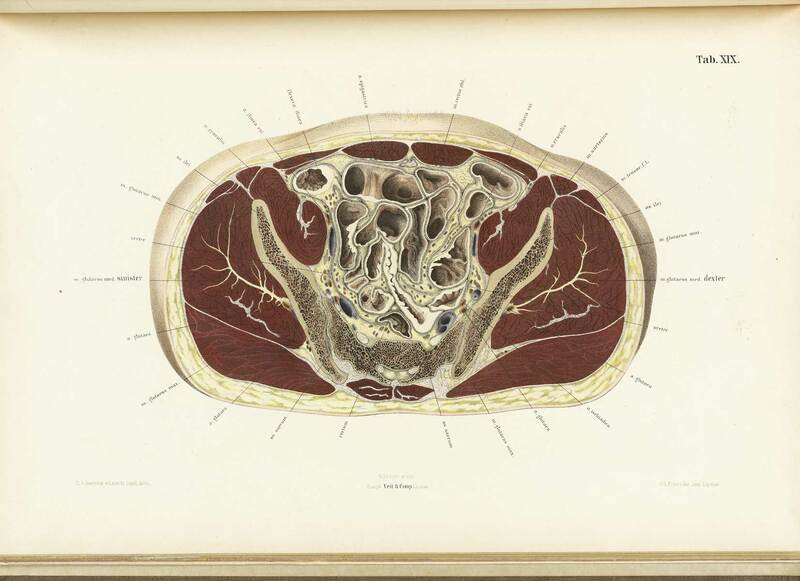 Similar techniques were used to create the supplement, Die Lage des Uterus und Foetus am Ende der Schwangerschaft, which features large folded plates. 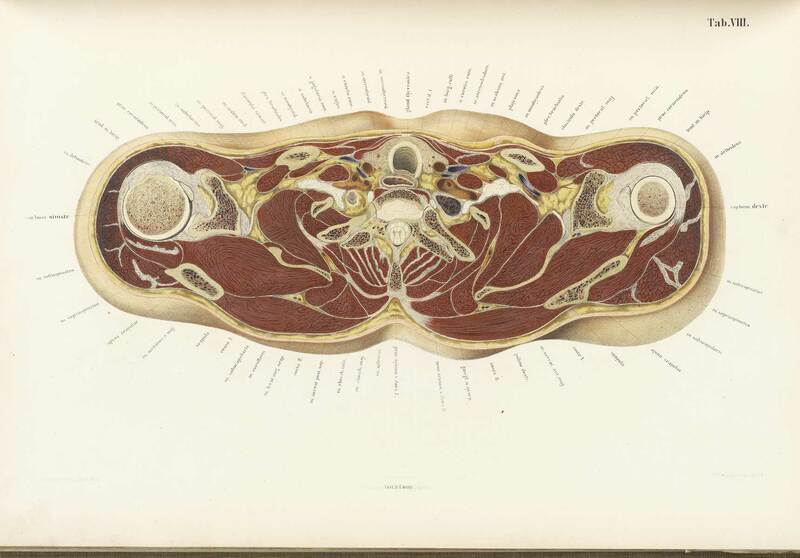 Tables B and C of the Supplement include large flaps showing different views of the lower half of the body, and scans were made of each flap along with the shared upper half (i.e. Table B (view 1), Table B (view 2), etc.)." I'm not sure where to go with this post, exactly--I certainly wanted to capture this incredible sentence, though, which is one of the most bizarre-sounding creatures I've encountered in quite some time. "The first liniment then is composed of the fat of young children seethed in a brazen vessel until it becomes thick as slab, and then scummed." --Montague Summers, The Werewolf, 1933. All's fair in love and shape-shifting, which is what this is referenced, part of a Witch's salve/potion for werewolf-y preparations. It came about while looking around for some information on an image here for the plant Solanum Somniferum, a woodcut engraving from Pier Andrea Mattioli's (1500 to 1577) translation of Panadius Dioscorides' (40-90 a.c.e.) De Materia Medica. This ancient botanical received treatment over the centuries by many writers (including Fuchs, Anguillara, Mattioli, Maranta, Cesalpino, Dodoens, Fabio Colonna, and the Bauhins), though Mattioli's (ca.) 1560 treatment included more than 150 text illustrations, one of which is this layered and flowing image of Solanum, which I believe is Shakespeare's "insane root", a basis for ointments and ungents of considerable diversity, finding use in undercoating for women's makeup, and as a purgative, and aphrodisiac. And of course as an ingredient for a witch's body lotion when dealing with such things as shape-shifters and werewolves, and also for hallucinogenic experiences, and (if enough is consumed) death. It seems an all-purpose plant, seemingly not far-removed (to my non-botanical anti-gardening mind, please forgive me) from the equally expansive belladonna, night shade, a wide-ranging plant that even though its name in Italian means something like "beautiful woman" is famous for its lethal qualities. This is the 15th installment of a new series on United States Patent Reports on electrical quackery and unsubstantiated bric--a-brac from the newly-electric world of the period of 1870-1900--the following is a little outside the norm, being French, but I couldn't resist it. And while we’re at it, let’s consider the work of Dr. Varlot (of the Paris Hospital) in electrocuting the dead. Actually, what he proposed was another pretty gruesome use of electricity, though this one didn't make promises of miraculous cures, or execute anyone. Varlot proposed to “metalize” the dead (as we see in this very unsettling image of a child being electroplated) for, well, some purpose, purpose unknown. It just seems and seemed like a bad idea, all the way around--a poster child for Bad Ideas everywhere. The medical uses of an electroplated baby seem very limited, and I can’t imagine anyone wanting to do such a thing to a dead child of their own. It is wrong on every level. "Dr Varlot, a surgeon in a major hospital in Paris, has developed a method of covering the body of a deceased person with a layer of metal in order to preserve it for eternity. The drawing illustrates how this is done with the cadaver of a child. The body is first made electrically conductive by atomising nitrate of silver on to it. To free the silver in this solution, the object is placed under a glass dome from which the air is evacuated and exposed to the vapours of white phosphorous dissolved in carbon disulphide. Having been made conductive, the body is immersed in a galvanic bath of sulphate of copper, thus causing a 1 millimetre thick layer of metallic copper to be deposited on the skin. The result is a brilliant red copper finish of exceptional strength and durability." Another method of electroplating the dead (in 1934) is discussed in the interesting blog, Quigley's Cabinet, here.